Hey!! I almost forgot that I would be announcing the winner of the Precious Remembrance Shop Coffee Love stamp set today and that winner is.... Denise Bryant!!! Denise please contact me with your mailing information and I will have Dyane at PRS get your set out to you. Hello!!! Got a couple of cards to share today. First up is a card for the current Essentials by Ellen pin-sights challenge. 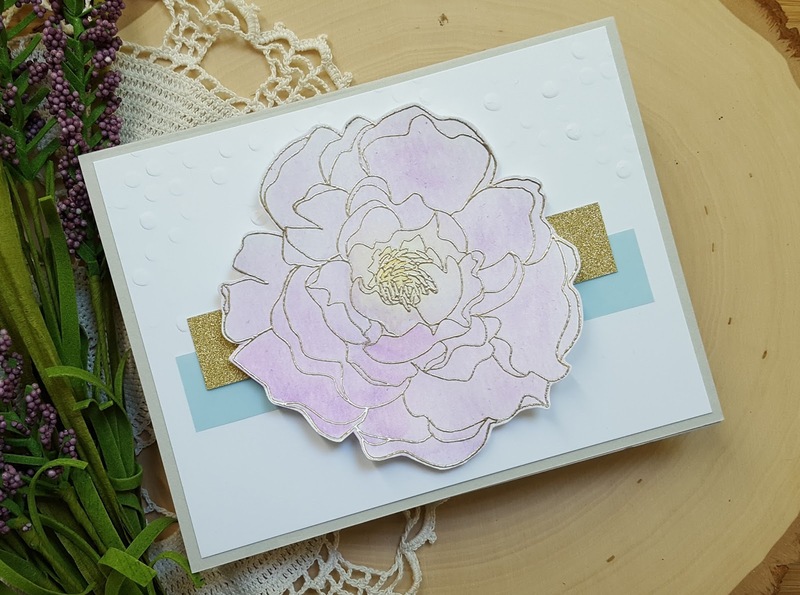 I pulled out Mondo Peonies and embossed the largest flower on watercolor paper using platinum embossing powder. 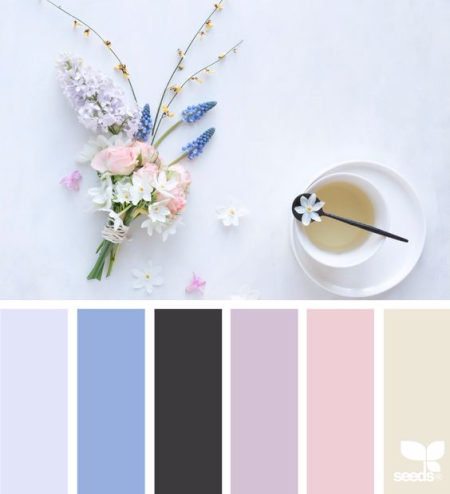 I checked the color palette for the pin-sights challenge and pulled out the light purple color for my flower. I used a light purple ZIG and did some simple watercoloring. Once the flower was mostly dry I trimmed it out with my scissors. Since the flower wasn't completely dry when it was trimmed out as it finished drying it curled up a bit which looks really pretty in real life. 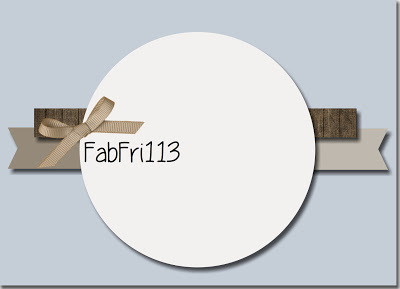 The layout is based on the sketch at Fab Friday. 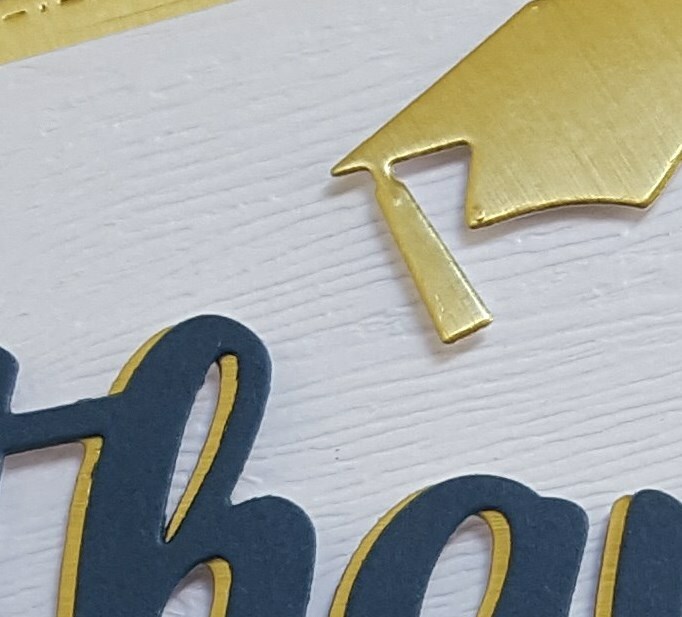 I partially embossed the top portion of my white cardstock piece before layering on a strip of light blue vellum and a strip of gold glitter cardstock. The flower was then layered on top to finish. I thought about a sentiment but decided to put one on the inside at a later date and just let the flower be the star of the show. 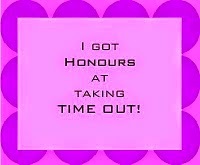 I think I will also post this to the current Time Out challenge. 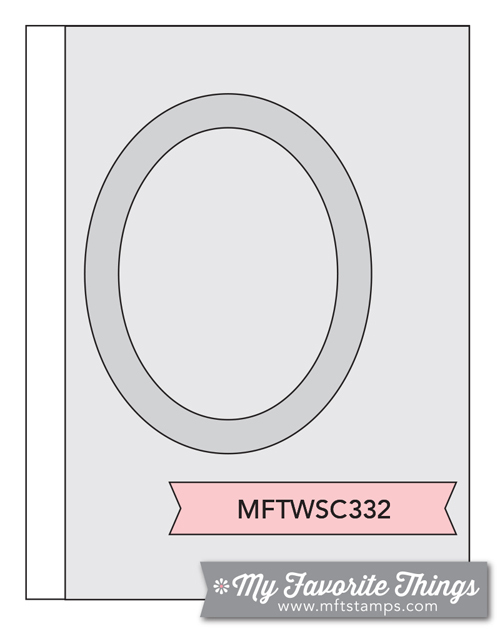 The second card is for the current MFT sketch challenge, as well as the current MFT color challenge. 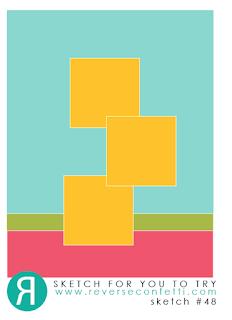 I will admit to having a bit of trouble figuring out how to use the colors in the MFT palette, but finally came up with this card. 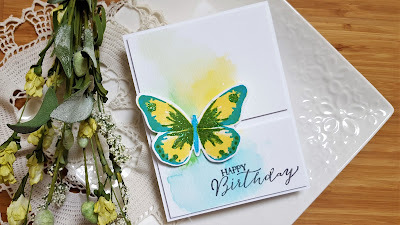 I pulled out the Beautiful Butterflies stamp set and stamped the butterflies using the Orange Fizz and Persimmon colors. The frame was die cut from Grout Gray cardstock using my Spellbinders square dies. The top panel was watercolored using a two blue ZIGs and then trimmed down with a border die once the panel was dry. 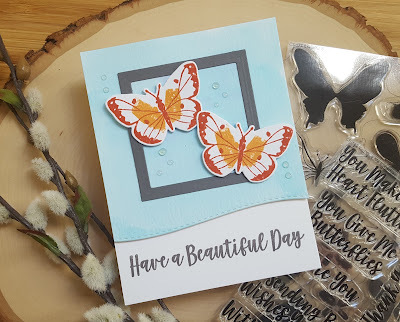 I attached the panel with some removable adhesive so I could get the sentiment from the You Give Me Butterflies stamp set in the right spot and stamped on the card base. I then attached the panel, the frame and the butterflies. I finished things off with some Nuvo Jewel Drops in Sea Breeze. Hello!! 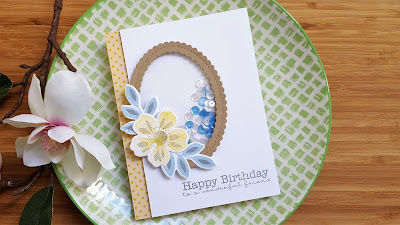 Stopping in with a card for today's PTI blog hop. The inspiration photo is beautiful but I must admit that I really struggled with this one. Tried several ideas last night, but came up with nothing. After looking through the cards that have been posted I was finally able to come up with my card. It is interesting to me how differently everyone sees the colors in the inspiration piece. Me... 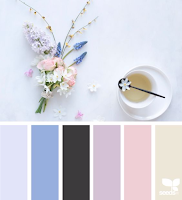 I see blues and gray/greens in the leaves, as well as peach and a ruby red. After trying a few different sets I finally went with PTI's Friendly Flowers. I used PTI's Ocean Tides and MFT Cornflower for the leaves and Hero Arts Soft Cantaloupe for the large flower and a Hero Arts red for the small flowers. 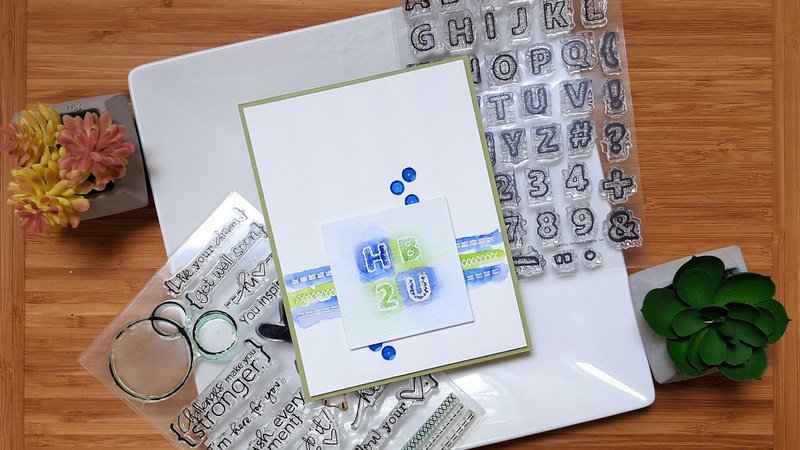 After stamping everything with my MISTI I added in the little dots with a small acrylic block and a little stamp that came with the set. The sentiment was stamped in black and then I added dots of Nuvo Crystal Drops in Morning Dew. The panel was adhered to an Ocean Tides cardstock base. Super simple and now I have another birthday card to add to my stash!! Hello!!! Wednesday is here, again, and that means I have a post up over on the AJVD blog. 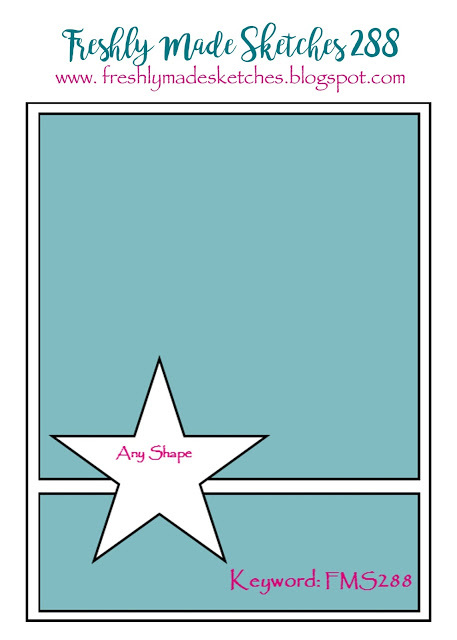 Here is a little peek of my card. 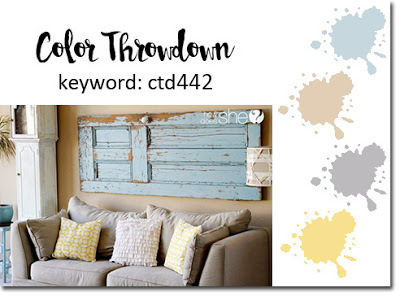 Head on over for a look!! guesting at precious remembrance shop! Hey friends!! Popping in to let you know that I'm guesting over on the Precious Remembrance Shop blog today! I hope you will take the time to head over there for a look and to let me know what you think. And don't forget... I have a giveaway going on. You can win the PRS Coffee Love stamp set by leaving a comment on this post. Happy Monday everyone!! Hope you had a wonderful weekend!! 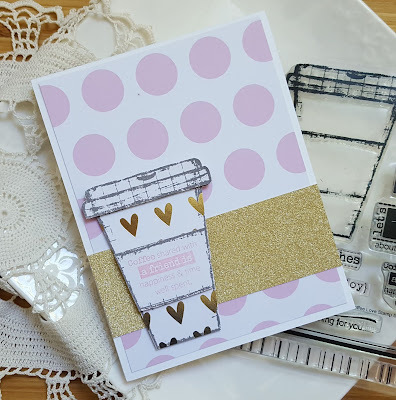 I'm popping in today with a card I made using the super cute Precious Remembrance Shop stamp set Coffee Love and to make things even more fun I get to give this stamp set away!!! 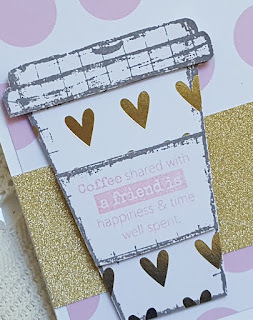 I know the Summer Coffee Lover's blog hop is just around the corner. This stamp set would be perfect to have on hand for just that event! A month or so ago I picked up a pad of paper from the Teresa Collins Gold Glam collection that was on clearance at Joann's and so I pulled that out to use to make my card. I stamped the coffee cup image on some paper that had gold foil hearts on it and then trimmed it out. All the papers in the pad are one sided so I was able to flip the paper over and stamp the cup lid and the little center portion. I stamped the sentiment in light pink ink and then trimmed out the lid and piece and adhered them with pop dots. I trimmed down another piece of paper from the pad that had these fun large polka dots. That was adhered to my card base along with a strip of gold glitter paper. Finished with the little coffee cup. Since I have glitter on this I'm going to add it to the Simon Says Stamp Wednesday challenge of a bit of sparkle. 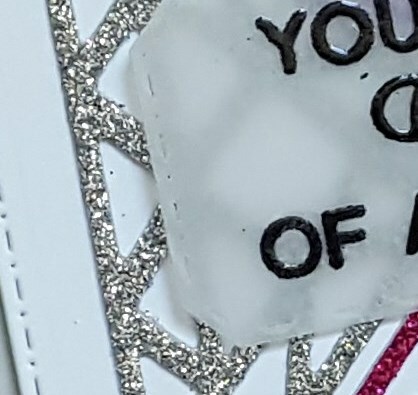 I included a close up of the sentiment since it is a bit hard to see. Have a wonderful day!! Please leave me a comment by Sunday, May 28th and I will pick a winner on Monday, May 29th. Well... the weekend is almost over and we have had a beautiful one here in the Pacific Northwest. The boys and I went out for a little adventure this afternoon and when I got back I finished up a card that I had started this morning for a few challenges: MFT color challenge, CAS(E) this Sketch and Less is More (geometric). 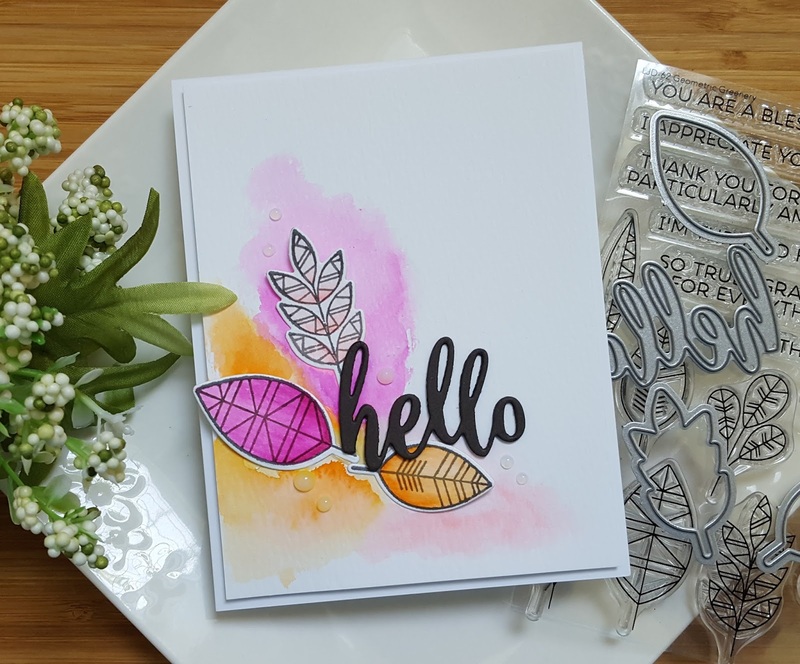 For the geometric component of my card I pulled out the MFT Geometric Greenery stamp set and stamped three leaves on watercolor cardstock using VersaFine Smoky Gray. I stamped the images using my mini MISTI so I could get a nice dark gray color similar to the MFT Steel Gray from the color palette. The leaves were then colored in a light pink, dark pink and orange using my ZIG clean color markers and clean water. Let them dry and then die cut with the matching dies. The hello was die cut from a dark gray cardstock three times and then adhered together. I watercolored each color on a panel of watercolor paper using the same ZIG markers. Once the panel was mostly dry I adhered the leaves and the sentiment. I wanted to use enamel dots in the same colors, but only had the orange and dark pink! My attempt to find sequins to match was even worse! So I just went with some Nuvo Crystal Drops in Morning Dew. Hope your week is going well!! 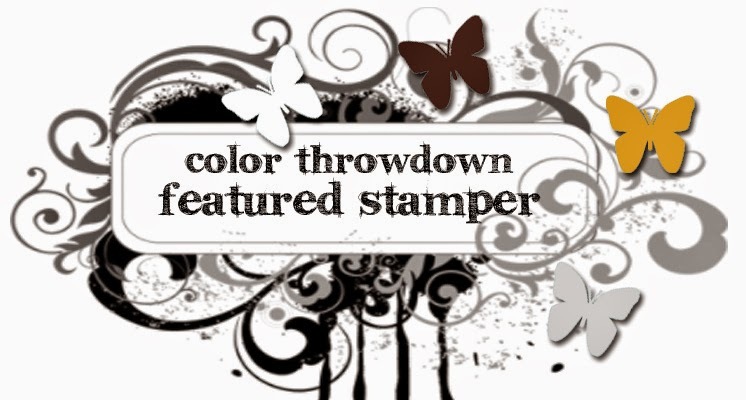 I have a card to share for a few challenges: Color Throwdown, Freshly Made Sketches and Simon Says Stamp Wednesday challenge. If you are like me (and I think you are, lol!) you have lots and lots of stamps and dies that aren't getting much love. Based on that realization I decided to go through my large collection of Stampin Up! 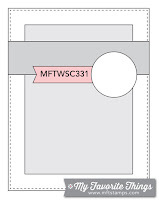 set and use one to create my card. The stamp set I went with is the beautiful Watercolor Wings set. 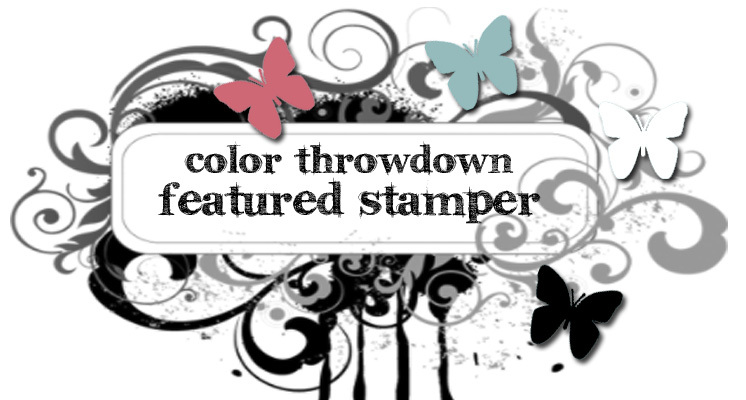 Using my mini MISTI I was able to stamp my butterfly perfectly using the Color Throwdown colors. The butterfly was then die cut with the matching die. 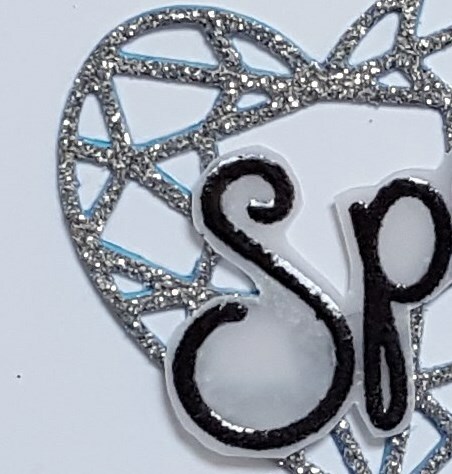 Since the Simon Says Stamp Wednesday challenge is to have some sparkle on your project I brushed on Stickles in Crystal to select parts of the butterfly. (To see the sparkle better click on the photo to enlarge it.) I did a little bit of quick watercoloring using ZIGs in the three colors from the CT palette on a panel of watercolor cardstock. Once the panel was dry it was trimmed down and cut into two pieces per the FMS layout. 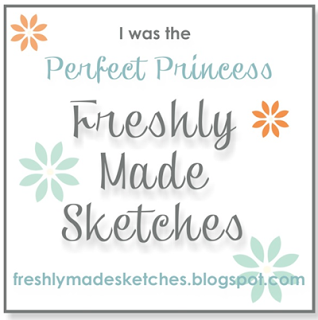 The sentiment is from another Stampin Up! set (Backyard Basics) and was stamped in VersaFine Smoky Gray. The pieces were adhered with foam dimensionals and the butterfly with multi matte medium. Now I have another sweet and simple birthday card to add to my stash. 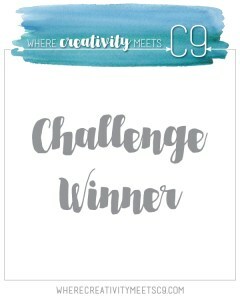 Popping in with a card for a couple of challenges. One is new to me and the other is an old favorite. 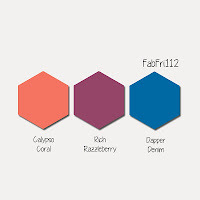 The new to me is Fab Friday and the old favorite is Less is More. 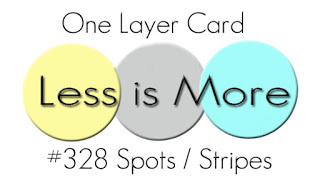 The challenge at Less is More is one layer with spots and strips in the mix so I used that as my jumping off point for the color challenge at Fab Friday. (Use Calypso Coral, Rich Razzleberry and Dapper Denim) I was going to use a stamp set that I had recently purchased from Stampin Up!, but because my card was going to be all stamping I had trouble getting all the colors to work well together with the images in the set. 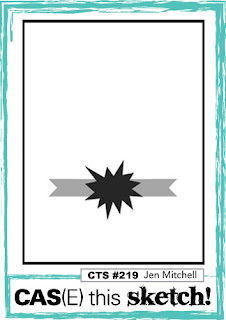 After repeated tries I gave up and pulled out a fun (but now retired) stamp set from Stampin Up! called Age Awareness and was able to make the colors work. For a simple card this one took me quite awhile to make. 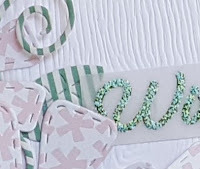 I originally started out just stamping everything using my acrylic blocks, but soon realized that things would go a lot better if I used my mini MISTI. I made my card and added some Nuvo Jewel Drops in black, but then ruined the card when I decided that I could add some more black to one of the drops. So... back to the starting block, lol! 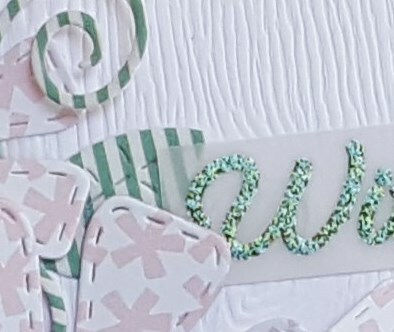 This time I got the card made and used Nuvo Glitter Drops in Blizzard White. Once the drops were dry I did not mess with them!! As you can see I have several different strips and spots, as well! Happy weekend everyone!!! I have a couple of birthday cards to share. 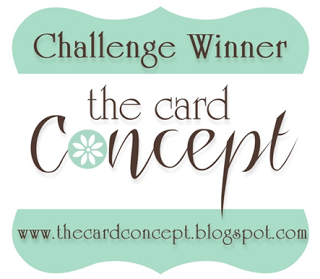 The first card is for the current MFT sketch challenge and the current Color Throwdown. 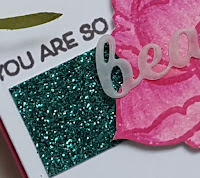 I used the MFT Flashy Florals set along with a sentiment from the MFT Pretty Poppies set. 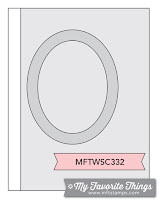 I started by die cutting an oval using the MFT Stitched Mini Scalloped Oval Stax set from kraft cardstock. The flower was stamped using generational stamping and MFT's Daffodil ink. The center was stamped with SU! Smoky Slate ink. The leaves were stamped with MFT's Blue Berry ink and then the detail image with Smoky Slate. Everything was then cut with the matching dies. A strip of MFT patterned paper in a yellow polka dot pattern was cut and adhered to my card base. A panel of white cardstock was trimmed down and stamped with the sentiment in Smoky Slate. Originally I was just going to adhere the oval, flower and leaves and call it good, but then decided to make a shaker. I filled the shaker with light blue and white sequins, adhered my oval piece and I was done!! 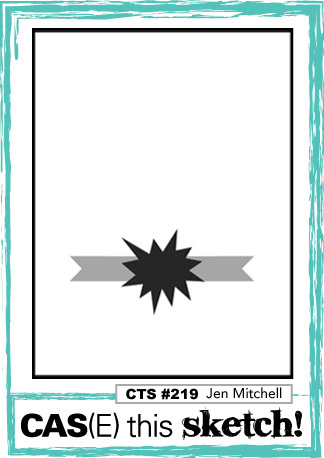 Since I have polka dots in the mix I will add this to the Simon Says Stamp Wednesday challenge of going dotty and this also works for the Simon Says Stamp Monday challenge to frame something. 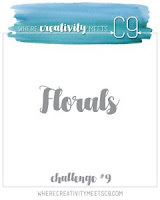 My second card is for the current Where Creativity Meets C9 challenge of florals as well as the current Freshly Made Sketches challenge. I have had the C9 You Are Enough stamp set for ages, but have not been happy with any of the attempts I have made to use the large floral image in the set. Finally last night I was able to watercolor something that I was happy with! I die cut the piece with an MFT Fishtail Flag Stax die and then wrapped the piece with the dark pink twine. I adhered that to a light gray cardstock base and then created my sentiment by using two sentiment pieces from the C9 Many Mandalas set that arrived in my mail box yesterday!!! That set is so beautiful... can't wait to use the mandalas in the set!! Anywhoo... the birthday sentiment in the set actually says "a happy birthday!" so I just inked up the sentiment and carefully wiped off the a and !. I stamped the "to you" and then trimmed both down and adhered them to the banner. Finished things off with a few little Nuvo Crystal Drops in Morning Dew. Hey friends... popping in to let you know that I'm guesting on the Precious Remembrance Shop blog today. 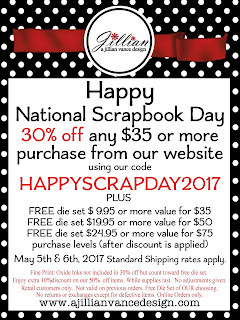 I hope that you will head over for a peek at my card!! Have a wonderful day!! Hello!! Hope your week is off to a good start! 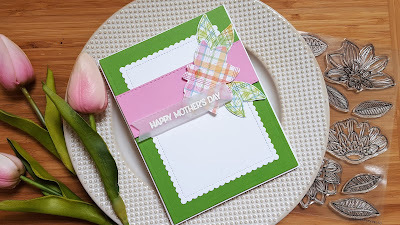 Mother's day is right around the corner and I needed a few more cards so over the weekend I made one using the current My Favorite Things sketch. I always want to play along with the MFT sketch challenge, but never end up finding the time so I was determined to get something made this weekend. The MFT Fancy Flowers set had been sitting on my counter for ages and so I used it along with some patterned papers from MFT to create my card. 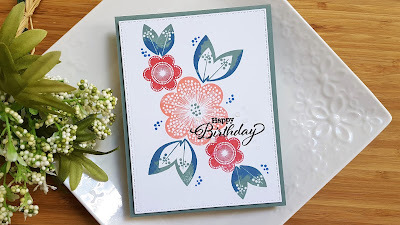 I stamped the flower using MFT's Bubblegum ink and then die cut it with the matching die. The leaves were stamped with MFT's Sour Apple and then die cut as well. 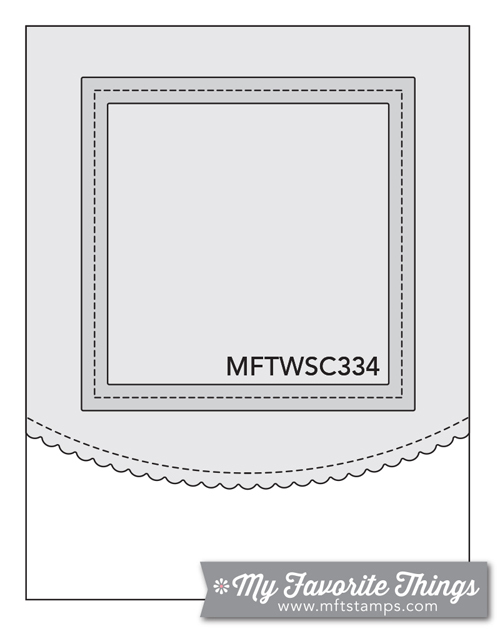 The scalloped rectangle was die cut with a MFT Mini Stitched Scalloped Rectangle die. 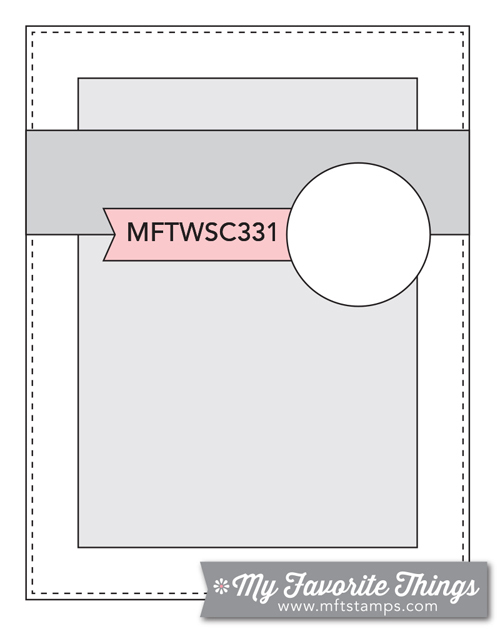 The pink cardstock was die cut with an MFT Stitched Fishtail Flag Stax die. I used a large rectangle die from A Jillian Vance Design to die cut the green cardstock. 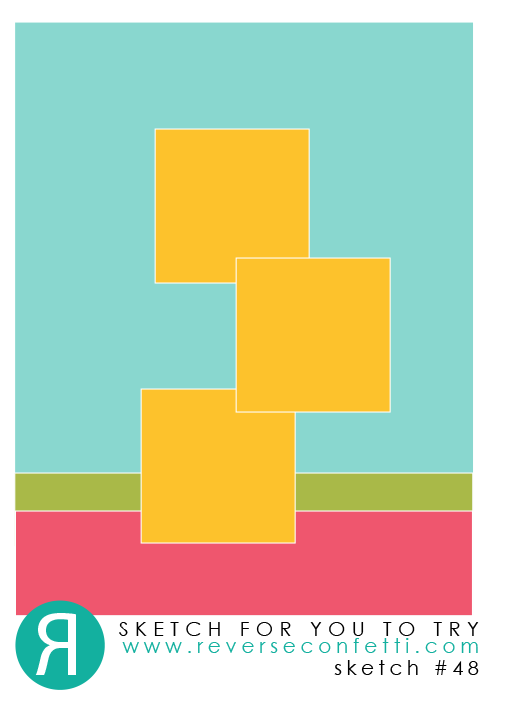 After layering the scalloped rectangle and pink strip I arranged and adhered the flower and leaves. 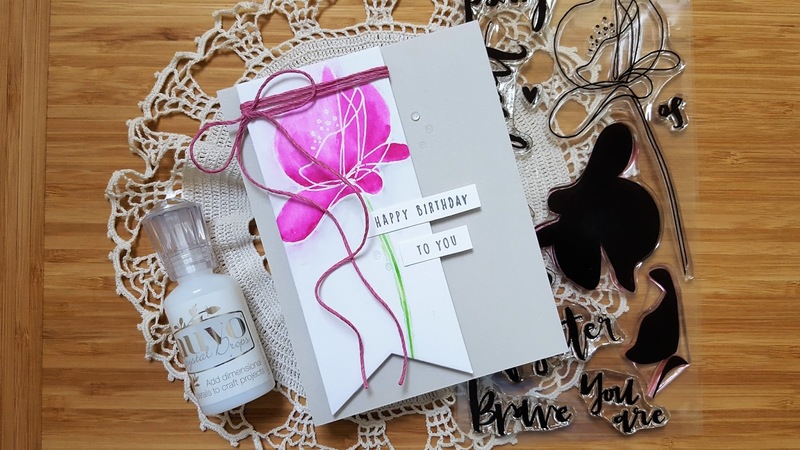 The sentiment (from A Jillian Vance Design) was stamped in watermark ink, heat set with white embossing powder and then die cut with a Fishtail Flag Stax die. I adhered the banner with rolled up glue dots. I'm also going to add this to the current Simon Says Stamp Wednesday challenge of a hint of pink. Hello there!! 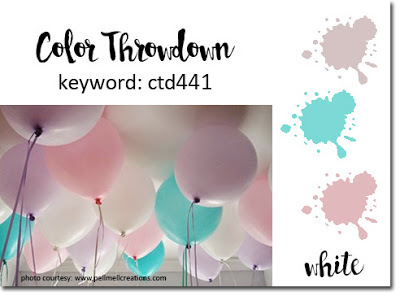 Popping in with a quick little card that I put together for a few challenges... Color Throwdown, Simon Says Stamp Monday challenge (great outdoors) and Simon Says Stamp Wednesday challenge (a hint of pink). 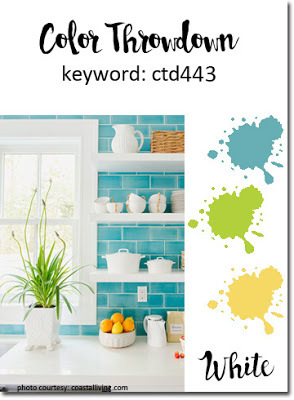 Must admit my aqua is more in the green family of aqua than the blue mainly because I thought that Stampin' Up! 's Pool Party had more blue in it than it actually does, lol, but I think that is okay. Quite awhile ago I purchased the Concord & 9th Fill In Phrases stamp set and it has been sitting in my little work area (my kitchen counter) ever since it arrived at my house. I finally used it for my card today... YAY!! The card is pretty self-explanatory. Solid image stamped in pink, detail image in light purple and the stems and leaves in aqua. The sentiment was stamped in VersaFine Smoky Gray. I added some Nuvo Glitter Drops in White Blizzard for some added interest, but you can't see them! (I think if you click on the photo to make it larger you will, tho!) I just love the oversized sentiments in the Fill In Phrases set! I think the one I used is perfect for a birthday card. Hello everyone!! 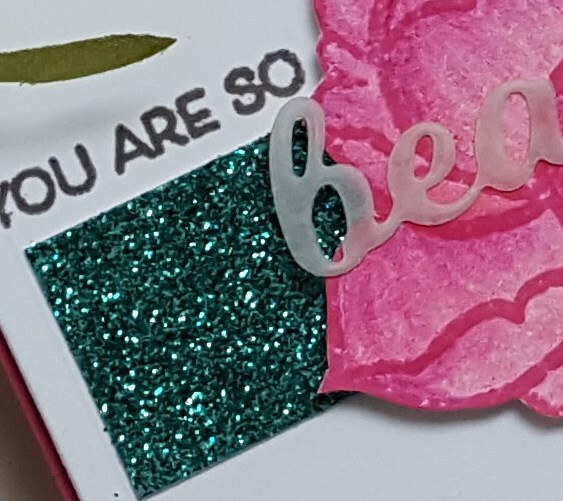 Popping in with a card for the current Reverse Confetti Sketch For You To Try as well as the current Essentials by Ellen Mix It Up challenge because this month's challenge is to mix Reverse Confetti with Essentials by Ellen. 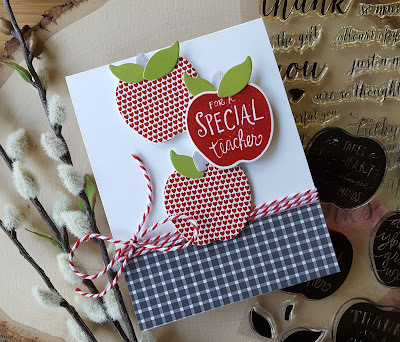 This week has been teacher appreciation and so I used the RC sketch to create a card for my son's teacher. I used the RC stamp set All Apples as well as the matching dies. Two apples were die cut from a RC quick card panel as were the leaves and stems. The apple with the sentiment "for a special teacher" was stamped with a matching red ink and then die cut with the apple die. Another quick card panel was trimmed down for the bottom of the card and then I added the red/white baker's twine. I added the apples and I was finished with the front of the card. 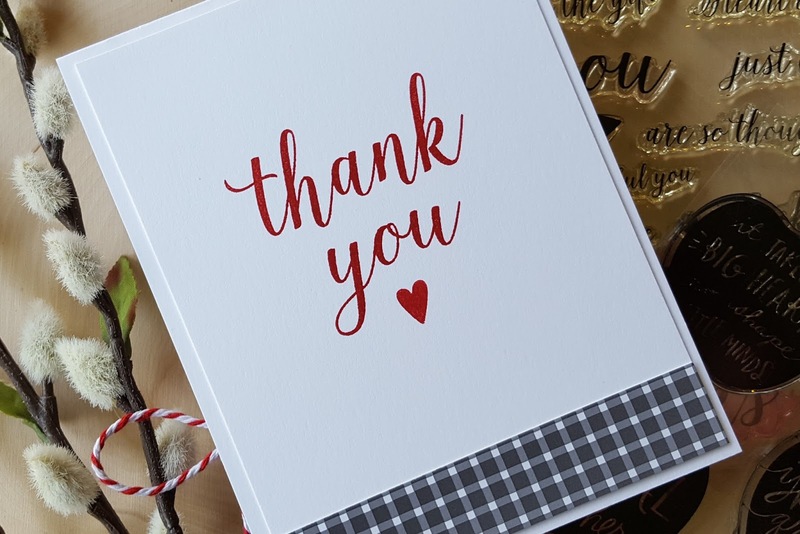 For the inside I stamped a trimmed down piece of white cardstock with "thank you" from the Essentials by Ellen Fancy Thanks stamp set and the little heart. 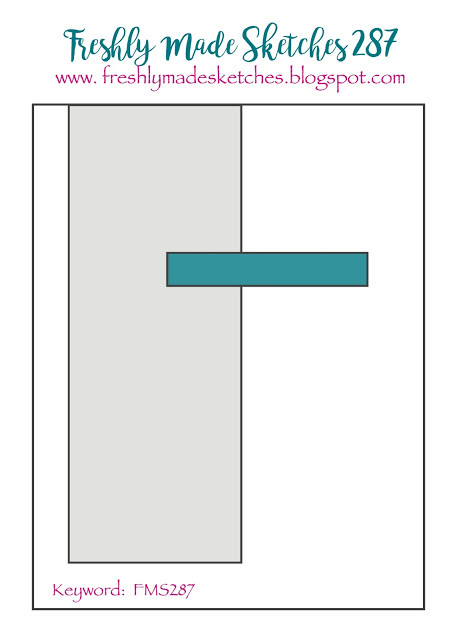 A strip of the same black gingham paper was added to the bottom and then the piece was adhered to finish off the card. I hope my son's teacher likes it! I think I will also add this to the current Simon Says Stamp Monday challenge of the great outdoors. 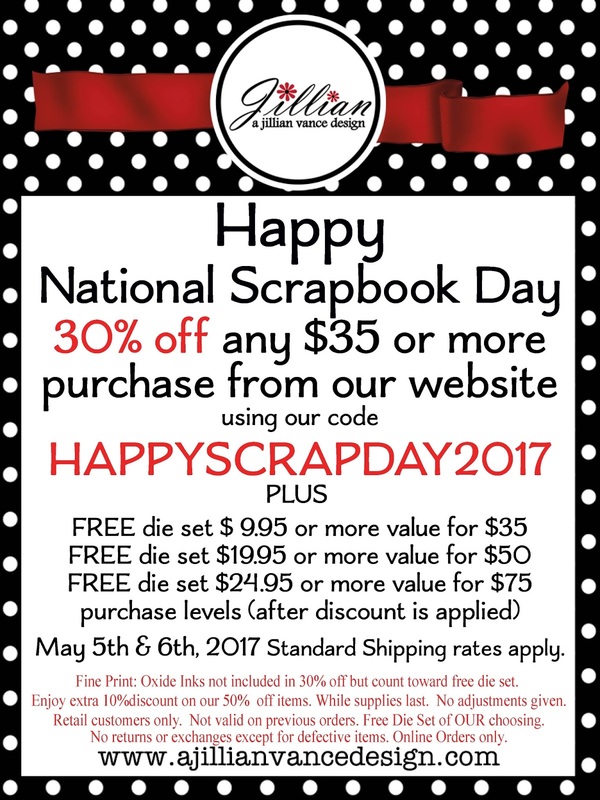 national scrapbook day sale at ajvd!! There are tons of fun new products in the AJVD store so head over there and save money plus get a free die set on some fun new goodies!! 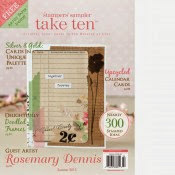 Precious Remembrance Shop New Release Blog Hop!! Happy Thursday everyone!!! 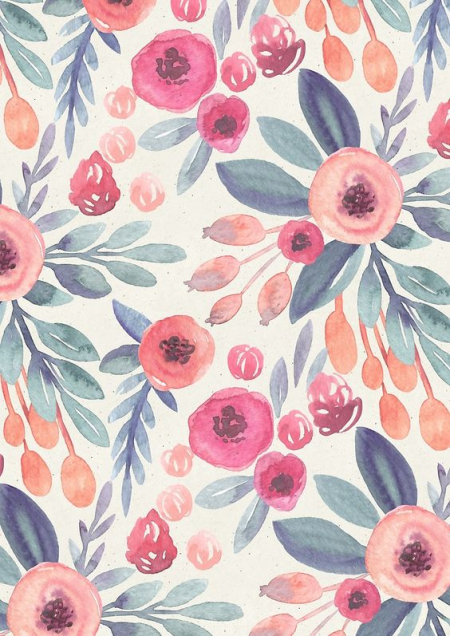 I'm excited to be hopping along with the talented gals of the Precious Remembrance design team today. There is a new stamp set called Sketchy Alphabet in the Precious Remembrance Shop line up and we are celebrating with this hop. 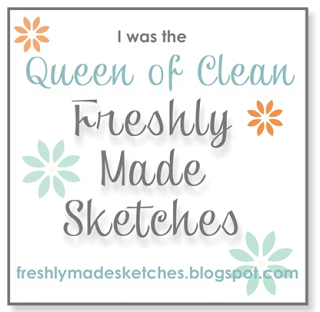 You should have arrived from the blog of the super talented, Sue Lelli!!! 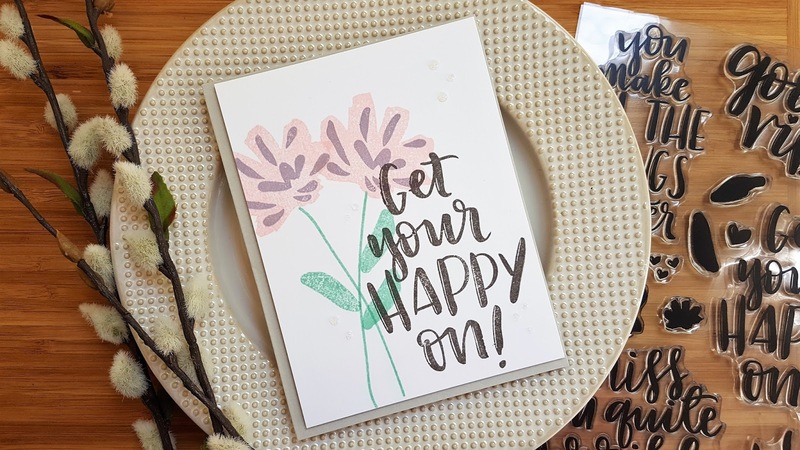 This fun new set will help you create personalized sentiments and fun backgrounds! For my card today I'm sharing a simple way to create a fun birthday card that would be perfect for just about anyone on your birthday list!! 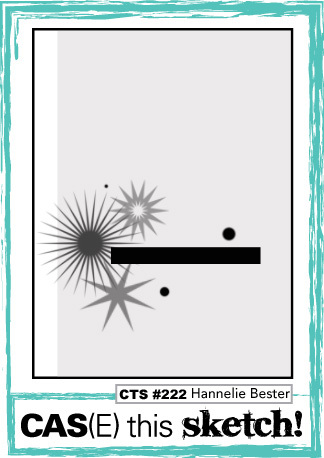 I started my card by arranging the letters h, b and u along with the number 2 from the set in a square on my mini MISTI. 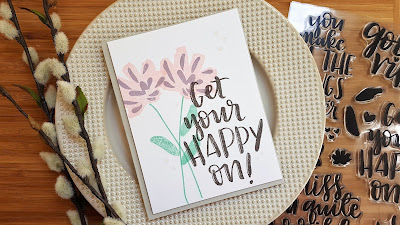 I then stamped the sentiment on watercolor paper with watermark ink and heat set with white embossing powder. I used a blue and green ZIG marker to color the letters and number blending out each color with clean water. Once the piece was dry I die cut the sentiment. 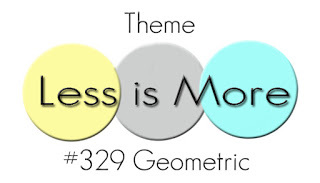 The border elements behind the sentiment are from the PRS set Positive Thoughts. 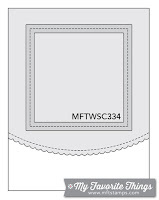 They were also stamped with watermark ink, embossed with white embossing powder and colored with the same two ZIGs. Since I used more green than blue I finished off the card with a few sequins that were similar to the blue used for the watercoloring. You could easily mass produce this type of design quickly. Your next stop on the hop is Deidre Payne . If you didn't start at the PRS blog here is a list of all the stops as well as information about how you can win this stamp set!! One lucky winner of the stamp set will be chosen randomly. To keep updated with our projects, join us on our Facebook , Pinterest , Instagram if you haven’t. Giveaway is open until Saturday, May 6, 2017 Midnight EST. Hope you have a wonderful day! Would love it if you take the time to head over to the AJVD blog and let me know what you think! have a beautiful day.. plus a winner! Happy Monday everyone!! 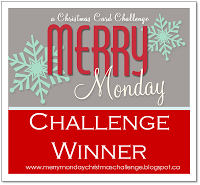 I'm stopping in to let you know the winner of my giveaway from last week, as well as to share a card that I made for a couple of challenges. First up is the winner of my giveaway and that person is...McStamper!!! Congrats!! Please contact me with your information (just click on the "see my complete profile" link and then on email) and I will get it to Dyane who will send you the set. I will be doing another giveaway on May 22nd, so please stop by then. Now on to my card I created this with the current CTS layout in mind. 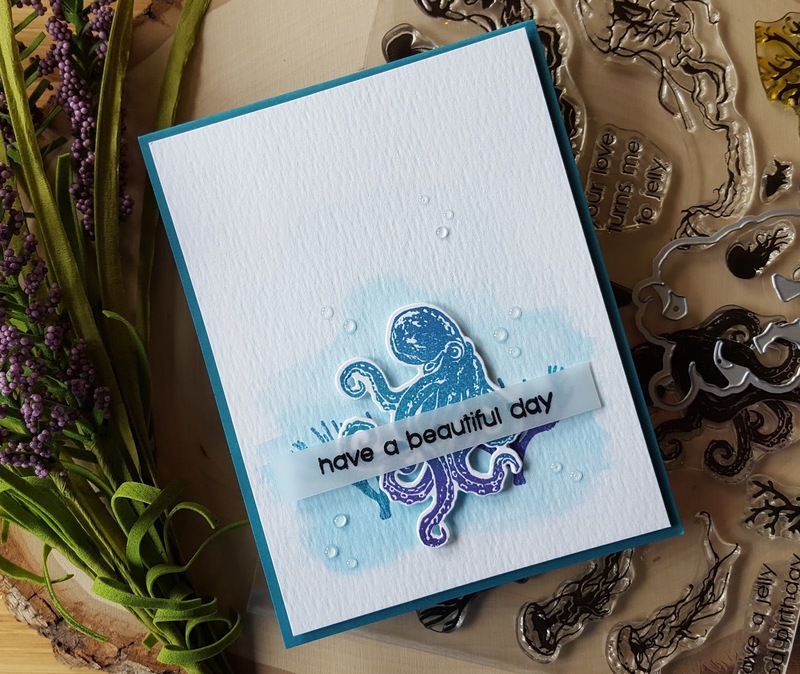 Over the weekend the Hero Arts creative team had been sharing "under the sea themed" projects that showcase the May My Monthly Hero kit and it made me think of a My Monthly Hero kit that I purchased last year that had a similar theme. So I pulled out the stamp set from the kit along with the matching octopus die and got to work. I used the Hero Arts Mermaid ombre ink pad and thanks to tips from Yana I was able to ink up my octopus perfectly! I did the same with the coral that is behind the octopus (sorry you can't really see it) and then watercolored the area using Ranger distress ink in Salty Ocean (of course) and let it dry. Once the panel was dry I trimmed it down and then adhered the octopus with pop dots. The sentiment was stamped on vellum and heat embossed with black embossing powder. I trimmed it down and then adhered it over the octopus with clear dots. I finished off the card by adding clear dots using Nuvo Crystal Drops in Morning Dew. I love how they look like little bubbles floating in the water! Since the theme at the Simon Says Stamp Wednesday challenge is anything goes I will be adding my card to that gallery.